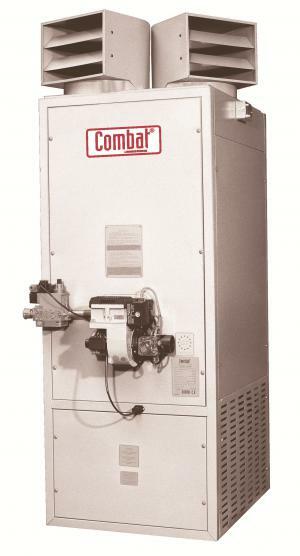 Roberts-Gordon Combat Cabinet Heaters are free-standing indirect fired units suitable for most industrial and commercial applications with a large range of heat outputs and burner options. There are 9 basic models sizes which can be fitted with bolt-on package burners for opertion on Natural or LP Gases, oil or waste oil. Units are available in horizontal or vertical configurations and for external locations. Variaous control and air discharge systems are available.